You are at:Home»Uncategorized»Good morning, Vietnam. Good night, Fargo. 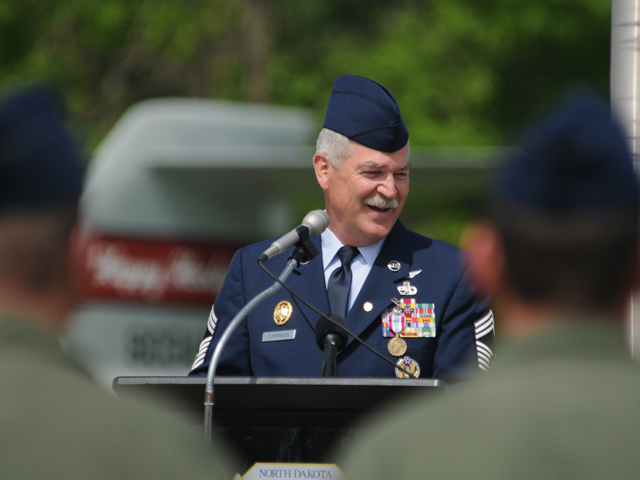 One of the last airmen to serve in the Vietnam War retired over the weekend. Chief Master Sgt. James Clemenson served as a door gunner on an Army UH-1 Huey on two tours in the early 1970s. He left the Army in 1972 and joined the North Dakota Air National Guard the next year. Clemenson worked in aircraft maintenance and later for an alert detachment and the NGB’s counter-narcotics division. He has been the senior enlisted manager for the National Guard Bureau joint staff since 2007. It’s unclear how many Vietnam vets remain in the ranks. Clemenson was the last enlisted airmen who served on a deployment to Vietnam. Chief Master Sgt. James Honeycutt of the National Guard Bureau went on a temporary duty assignment to ‘Nam. The release from the North Dakota ANG left open the possibility Vietnam vets could still be serving as traditional Guardsmen.